This area should cover water systems standard water wheel Pelton wheels, generator heads, speed regulation, head pressure, etc.etc. I would like to start out by saying my heart goes out to the Gulf Coast victims of Katrina. We were hit by her directly when she was only a category 1. The plan of attack provided below is the same one I used to keep 3 fish tanks powered (and a small fan) going for the 3-4 days we had no power as a result of hurricane Katrina. This plan is tried and true. I have been reading on a lot of fish keeper forums that everyone is wondering how to keep their tanks running when the power goes off? I have lived in south Florida my whole life, and in between the intense lightning storms and the hurricanes, living temporarily with no power is definitely a regular and expected event. Worry no more as I am about to share a couple tips with you that will not only keep the air going but your filters and heater too! If you follow all of these tips you could theoretically run your tanks forever without using a wall socket. 1-Odyssey 925 cranking amps, sealed, deep cycle, dry cell battery. Odyssey makes batteries for the military and recently made these available to the public. This battery is smaller in size than your car battery, but packs wayyy more amperage. The reason I specify THIS battery is because: IT IS DANGEROUS TO BRING A NORMAL CAR BATTERY IN THE HOUSE!! DO NOT DO THIS! Normal car batteries contain sulfuric acid and are prone to vapor leakage. VERY DANGEROUS! The Odyssey is a SEALED, DRY CELL. Nothing will ever endanger you inside this battery unless you were to crack it open with an axe. There are other sealed, deep cycle batteries on the market but none are as small or low price as this one. Also has lifetime warranty. If your budget permits I suggest buying two of these as it will allow you to keep your tanks running seamlessly if planned right. 1-400 Watt DC to AC Power Inverter. I use a Black & Decker model I purchased at Wal-Mart for $40. Has quiet built-in-fan. I suggest using a 400 watt inverter as they have 2 outlets available on them. I have used power inverters from other companies and they will basically all do the job, however I must admit the Black & Decker unit was definitely quieter and of better quality. Make sure you get one that comes with alligator clamps that can be clamped directly on the battery. When you get this unit open it, test it, and become familiar with it. I suggest having extension cords available as some people like me have more than one tank but not in the same room as each other. Remember you are no longer relying on wall sockets. Your power is going to come from the inverter and if you have multiple tanks you probably have to run extension cords to allow your pumps' plugs to reach the inverter (again this is only if you are powering more than one tank). Now to get to it. The inverter is going to come with alligator clamps so you can attach it directly to your car battery. I suggest you find a location that is in the middle of all your tanks. Put down a towel or some thick cloth on the ground. Place the battery in the middle of this towel. This is just to keep the battery off the floor and moisture away from it. Place the positive and negative (red and black) alligator clamps from the inverter on the terminals of the battery and turn the unit on. If you have everything hooked up correct the inverter should power up, if anything is wrong the inverter will sound an alert or simply not power up. You can now plug in your pumps to the inverter. If you have a big tank with air and multiple pumps, I suggest using only one pump per tank while the power is out. This will allow you to keep the water moving for the most amount of time. You don't even really need to keep your air pump going so long as your water is moving (circulation oxygenates water all by itself). On my 75 gallon I have a canister filter and an Emperor hang on tank. I keep just the Emperor running when the power goes out as it not only circulates the water but also heavily oxygenates due to its bio-wheel. By doing this your fish can basically go on happily and never notice a change in the water chemistry. After hurricane Katrina hit my power was off for 3-4 days. I didn't even have to do a water change when the power came back on my 26 gallon since the Aquaclear 50 on their tank never stopped running. Silly that I have to mention this but do NOT bother plugging in your lights unless you have a reef system that NEEDS it. Lights will drain your battery much faster than your pumps will. Ok now here is how you can keep this system running FOREVER with no wall power. 1-The Odyssey battery is really a super car battery. If you were to purchase TWO of the Odyssey batteries you could have one powering your tanks and keep the other..you guessed it..UNDER YOUR HOOD! If you have one functioning as your car battery it will always be full. When the power in your home goes out and use all the power in your battery just swap it with the one under your hood. Since the battery you are putting under your hood will be dead you WILL need a jumpstart to get your car started. You could do this forever and always have a battery full to run your tanks. I know this is a lot of work but hey you only have to do it in times of extreme weather/power outages and anyway no one said this was supposed to be fun. It's about keeping your fish ALIVE! If you are sure you have everything planned out properly you could even use the inverter to power your cell phone charger, run a small fan, etc. Any of the really low power things you have that need electricity. Best of luck to my fellow fish keepers! 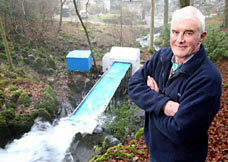 Scotsman Ian Gilmartin, 60, and his friend Bob Cattley, 58, both from Kendal, Cumbria have invented a mini-waterwheel capable of supplying enough electricity to power a house - for free. The contraption is designed to be used in small rivers or streams - ideal for potentially thousands of homes across Britain. It is the first off-the-shelf waterwheel system which can generate a good supply of electricity from a water fall as little as 20cm. Looks good hopefully they will have more info. soon. David DuByne explains about the ingenious Gravitational Vortex Power Plant, which works a little like a ram pump, using water drop in a stream, but by adding a simple rotor to the water to create a vortex, is able to generate 50,000 kW per small simple plant. An 18' wide cement pool is built around a stream in such a way as not to dam up the water, but to divert the water briefly into the pool to be swirled by the rotor, and then allow it to flow on out again. Addendum: It is said not to harm fish. Please see above article.